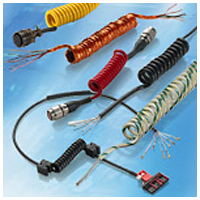 In addition to the standard range of Micro-D connectors & assemblies, axon’ is able to develop custom designed solutions, based on Micro-D twist-pin contact technology. Such solutions are ideal when the operating conditions are critical for applications including aerospace, military, industrial, medical or off-shore. Axon’ offers a complete range of Micro-D connectors to MIL-DTL-83513. How to route power and RF signals through very small connectors: Combo-D connectors. Micro-D Space Axon’ Connectors (MDSA range), 120 way Micro-D applications, high data rate links, 10 Gb/s Ethernet links are part of the space micro-D connectors that Axon’ can offer. 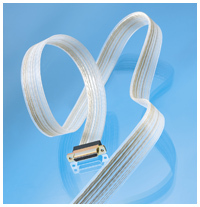 For the most demanding applications: filtered connectors, non magnetic connectors, hermetic connectors are examples of Axon’ custom Micro-D connectors. 0.635 mm (.025”) contact spacing connectors to the MIL-DTL-32139. 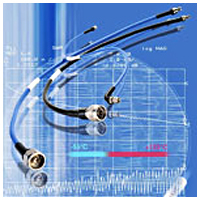 Nano-D connectors meet applications which require extreme miniaturization. 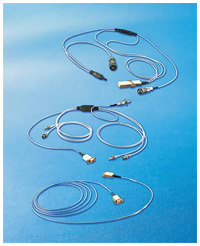 EMI backshell, axoclamp®, clamping band, hardware: accessories for Micro-D connectors. Micro-D assembly kit. Axon’ have developed a triaxial connector called ACB1(axon’ connector bus series 1) suitable for any type of twisted shielded AWG 24 pair cables.The connector is crimped on to cables and assemblies designed and manufactured to MIL-STD-1553. ACB1 connectors for MIL-STD-1553B databus applications Axon’ have developed a triaxial connector called ACB1 (axon’ connector bus series 1) suitable for any type of twisted shielded AWG 24 pair cables. 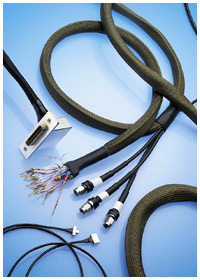 The connector is crimped on to cables and assemblies designed and manufactured to MIL-STD-1553. no need for two crimp tools ; one die and one or two positioning tools like most connectors. ACB1 connectors and mating halves can fasten together with either pin or socket contacts: the connector is mounted to your needs. ACB 1 connectors have gone through test sequences defined by the EN3716 standard. The only connector approved to ESCC3401/079 by ESA. Axon’ offer a complete range of Micro-D and Nano- D interconnect assemblies which is ideal when the operating conditions are critical for applications including aerospace, military, industrial, medical or off- shore. 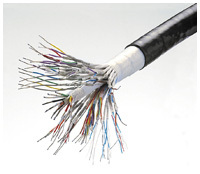 >Axon' offers cat.6a RJ 45 assemblies for reliable 10 Gb Ethernet. The RJ45 system incorporates a 38999 series III metal shell with full 360° EMC and mechanical protection. 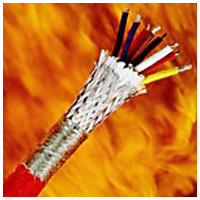 It has been designed to meet the requirements of high speed Ethernet connections. Axon' also offers a high speed 10 Gb/s Micro-D Ethernet link for severe environment. Military : land, marine, aeronautics. Makkays is an authorized sales representative of Souriau, a France based company which provides connection solutions from standard connectors based upon national or international specifications to complex interconnect systems for 3 main markets: Aerospace (Civil & Military), Defence Space (Military Marine, Communications, Satellites, Launchers) and Industrial (Railway, Geophysics, Instrumentation, Automation, Process Control). The MiniMez connector is especially suitable for highly demanding systems that require for reliability and robust connections. Providing 4 different heights of the male connectors and a standard female connector, the MiniMez connector system provides stacking heights from 6.5 mm to 12 mm in steps of 2 mm. The unique design blindmate features with fully shrouded male connectors and robust thick side walls ensure polarized blindmating without worry of housing wall breakage. For termination, engineer can select SMT for maximum PCB real estate usage or DIP solder for extra mechanical strain relief. Optionally, PCB locking clip is available for the SMT termination to take advantage of maximum PCB real estate usage while not compromising on the PCB retention force. 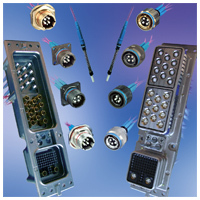 Modular jack connectors, a cornerstone of communications technology, have been used in the telecommunications and Ethernet industry for many years. The main reasons for this are the simplicity and reliability of these products. Whether integrated in a simple telephone system, or in a gigabit application, “mod. jacks” represent the standard for network connections. Mod. jacks can be obtained in many different versions. Increasing data rates and space-saving requirements are driving increasing requests for these connectors with integrated filter components. D-Sub connectors are primarily used as interface connectors. With various pin counts and termination types available, these connectors are found in almost all applications. ERNI has a comprehensive line of D-Sub connectors. Whether for easy assembly, different connection types, EMC, or interlocking, you will find innovative solutions from ERNI. 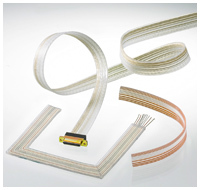 Today's printed circuit board designs demand flexible and economic connector concepts. For our customers this means availability of a complete series with all connection technologies at an attractive price. They are available in male and female with different termination types, both straight and right angled. This quality machined connector is fully RoHS-compliant. ERNI has set up it’s first Asia backplane & cable assembly factory in Beijing, China: ELSA ERNI System. In addition to quality electronic components, ERNI now offers a reliable and fast PCB & cable assembly service for quick testing, trouble shooting and verification of design. Technical assistance, prototyping, pilot run and first series manufacturing are available from ELSA ERNI System. No volume is too small. From supply of material (connectors, PCB, cable, sub-rack, etc. ), assembly, logistics to testing, these vertically integrated services from ERNI provide a total solution to the customer.